Teaching Authors--6 Children's Authors Who Also Teach Writing: Happy Blogi-VERSE-ary!!!!! Hip (to the 5th power) Hooray! Our TeachingAuthors group blog has been teaching authors since April of 2009! To celebrate the occasion, we’re celebrating you! Enter our Raffle drawing to win one of FIVE Blogiversary Book Bundles – each bundle a set of five books hand-selected by a TeachingAuthor that includes at least one autographed TeachingAuthor book. Check the end of this post for details. It’s also our Blogi-VERSE-ary, so smartly re-named by our reader Mary Lee of A Year of Reading, because we six TeachingAuthors chose to celebrate the occasion by reciting our favorite poem in honor of Poetry Month. I suggested the idea once I read about the Poetry Foundation’s current Favorite Poem Project: Chicago which grew out of former Poet Laureate Robert Pinsky’s national Favorite Poem Project – Americans Saying Poems They Love which celebrates poetry as a vocal art. "Chicago" by Carl FYI: the Poetry Foundation, located in beautiful downtown Chicago, is an amazing resource – for writers and readers, for teachers, of course, but really-and-truly, for anyone human. To plan a (highly-recommended) visit, click here. To explore the children’s poetry resources, click here. Students can find recitation tips and look for poems here. Teachers can learn all about Poetry Out Loud in the classroom by clicking here. So you’re never without a poem nearby, click here to download the Poetry App. The poem I chose to recite via SoundCloud (and – fingers-crossed – successfully uploaded to today’s post so you can hear it) is Robert Louis Stevenson’s MY SHADOW. In between Halloween and Thanksgiving of that third grade year, each of us was to choose, memorize and then recite before the class eight lines of a poem. I instantly knew the poem I’d choose. 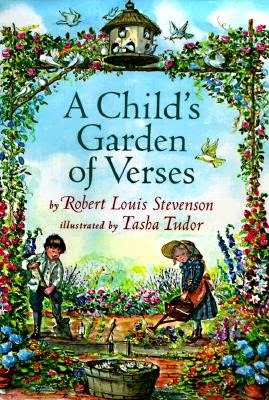 I treasured my copy of A CHILD’S GARDEN OFVERSES. 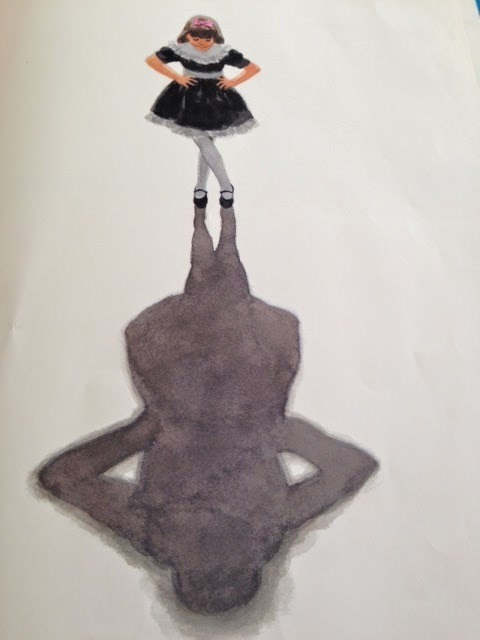 How could I not choose my favorite poem, My Shadow? I loved the poem’s sing-song rhythms; I loved its playfulness. I even recall jumping rope while I recited the poem, practicing, practicing, practicing. I so wanted to get it right. Standing before my classmates in the front of my classroom, beside Miss Atmore seated dispassionately at her desk, demanded Courage and Moxie, both of which I lacked. "My poem is My Shadow,” I bravely began, and Miss Atmore stopped me, cold, mid-sentence. The rhythm of the lines ran away (probably scared); I mispronounced "India" as "Indian." All I could do was stare at the two shiny pennies that adorned my new brown loafers. Ironically, when I was first trying my hand at writing for children, I wrote a poem entitled “P-O-E-M is a Two-syllable Word.” In time the title became a line in the first poem I ever sold, to Ebony Jr. magazine. I’ve searched high-and-low for my copy so I might share the poem, but alas, no luck. Even today, I can’t speak the word “poem” without enunciating clearly its two two-letter syllables. He is very, very like me from the heels up to the head. I offer at least five bundles of thanks to you, our readers, for embracing our blog, and to my fellow TeachingAuthors too – Jill Esbaum, JoAnn Early Macken, Carmela Martino, Laura Purdie Salas, April Halprin Wayland and currently in absentia but always in my heart, Mary Ann Rodman and Jeanne Marie Grunwell Ford, for embracing me. I did indeed find that long-ago missing Moxie and each of you makes sure I maximize it bi-monthly. Here’s to a month of poetic celebrations! Oh, and don’t forget to enter our BlogiversaryRaffle to win one of FIVE Blogiversary Book Bundles. Sorry I was unable to correctly upload the one and only recording that was successful - and - have the image appear, not just the link. Please ignore my practice recordings - even though we all know: practice makes perfect! What fun to hear your voice and see you in such a lovely setting on a cloudy Monday morning! You apologized for not making it work, but it worked fine for me, and the picture is there, and wonderful! Thanks for your cautionary tale, Esther. I wonder if we don't all have a story like that, and sadly, remember too well! I love the poem, and have already shared it with my granddaughter while we went walking & looking for our shadows. RLS is a treasure still, isn't he? Thank you! Wonderful poem. Thanks for sharing it. I had never read it before. Great story! I have always said "poem" instead of "po-em." Oopsy..
*runs to check to see if poem can be read either with one syllable OR two. Darn that Miss Atmore - she was right! It's two syllables, all right. Miss Atmore was quite the Dark Shadow in my Life that year I was 9 but no matter how awful she was, I STILL love Robert Louis Stevenson's My Shadow. I owe Carmela Big Thanks for correctly embedding the Soundcloud image for me after my initial post. And thank you, Sera, for reconnecting me to Poe's poem Alone. I hope readers will visit the Poetry Foundation website and discover all sorts of wonderful resources. Isn't lovely how over a lifetime you've made lemonade from a sourpuss? I just downloaded the Poetry Foundation's mobile app! Thanks for this fab resource--Yay!